Elves delight the readers of fantasy books and gamers alike. Ephemeral beings of light and spirit, they dance just on the edge of our awareness. They can be angels and demons, the personification of otherworldly magic or nature spirits depending on who does the telling. They may be warriors, wizards, singer,s poets, dreamers... or nothing at all, just figments of movement at the corner of our eyes. 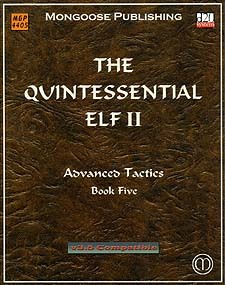 The Quintessential Elf II: Advanced Tactics focuses on trying to help the reader get the most out of what he already knows about elves. It starts off with basic rules for tailoring elves to fit specific roles in a campaign or world. We then move on to discuss building truly epic elves using multiple classes and legendary career paths that lead to the ultimate reaches of combined martial might and elven magic. Then there is the technology and knowledge of the elves. Rather than presenting a single possibility, this book describes the magical and mysterious elven culture, their ways and means of item creation and their fey tricks. How do elves that are effectively angels differ from those who represent the spirits of nature? What tricks does a wild spirit elf use that a near divine immortal does not? Elfin crafts, grown crystals, living magic, woven light, charm feats... all are presented in a discrete, mechanically clear manner, keeping to the theme of elves as essential spirits. Elves express something fundamental, something primal about their world. This purity gives them strength even as it blinds him to the concerns of lesser mortals.